A combo meal typically includes a combination of item in it. 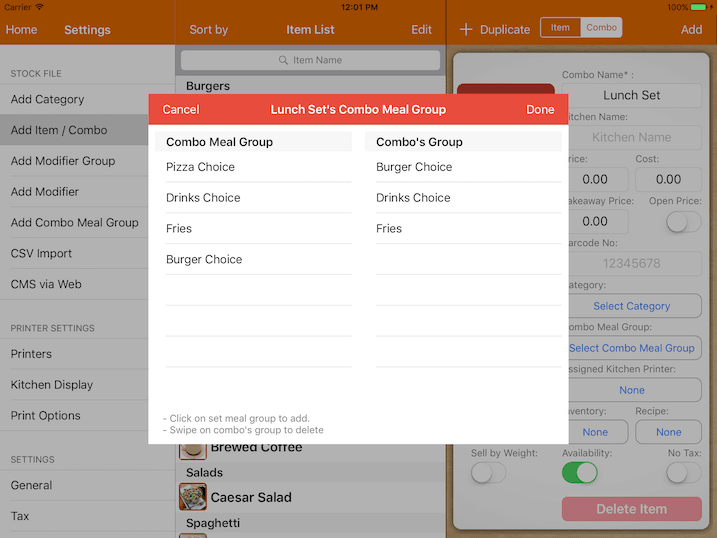 However before creating a combo meal, we will have to create each of the combo meal group. The hierarchy of a combo meal: Combo Meal -> Combo Meal Group -> Items. In this guide, we will use Burger, Soft Drinks & Fries to complete it as a combo meal. 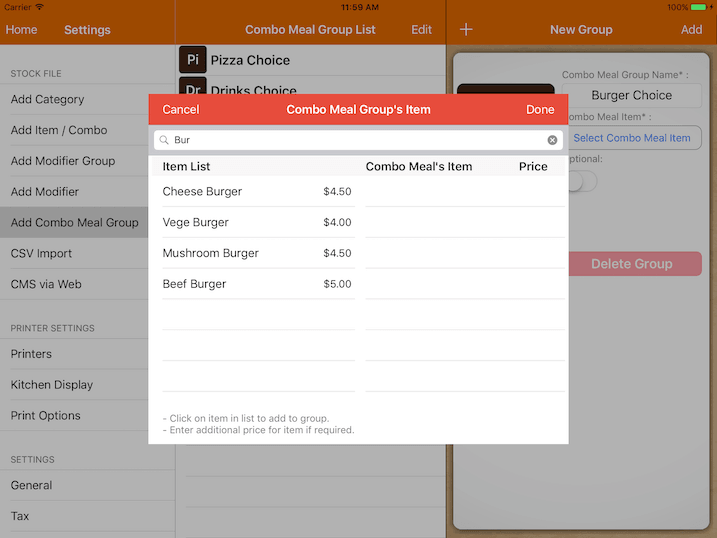 Firstly we will need create a number of combo meal group and specify what item is in it. Click on + button on the top to add a new one. Enter the combo meal item name. In this case we will name it as 'Burger Choice'. Click on Select Combo Meal Item, a pop up as below will be shown. 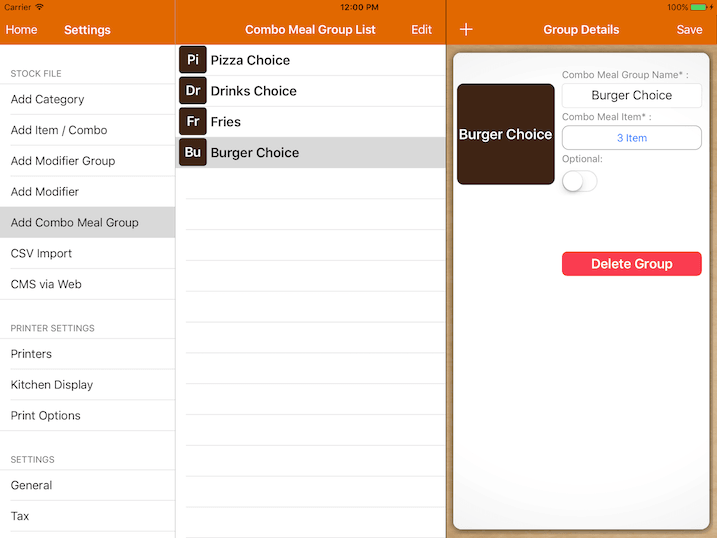 In the search bar, enter the name or category of the item you would like to include it in this combo meal group. Click on the Enter button in the keyboard to perform the search. Select item you would like to include from the list populated on the left. By default, all items have no additional price, specify in the price column if it is required. Click on Done and Add the group. You would need to repeat the above steps in order to create a number of combo meal group. 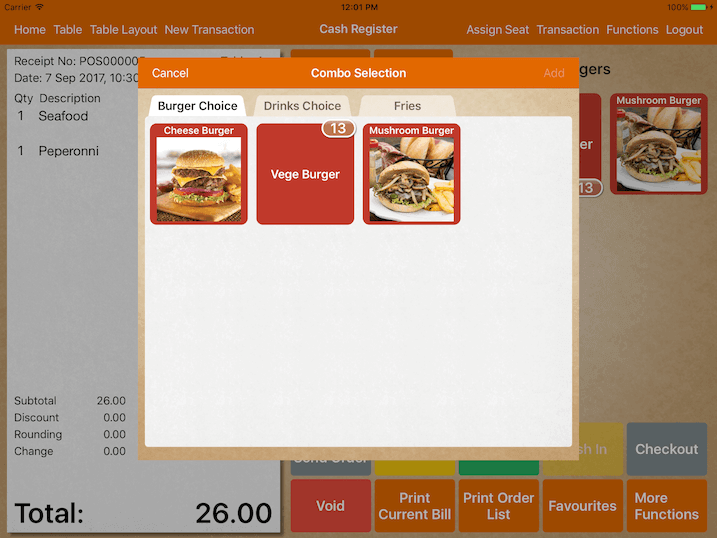 As you can see in the screenshot below, we have created 'Burger Choice', 'Drinks Choice' and 'Fries'. To create the actual combo, we have to do it under Settings -> Add Item/Combo. Under Add Item/Combo, click on + and make sure you select Combo instead of 'Item' in the segment. The process of creating a combo is the same as item, however it is compulsory to assign combo meal group for it. Click on Select Combo Meal Group, choose meal group to be under this combo. As you can see we have added 'Burger Choice', 'Drinks Choice' & 'Fries to it. Now specify the price for this lunch set and save. The process of creating a combo meal is now complete. 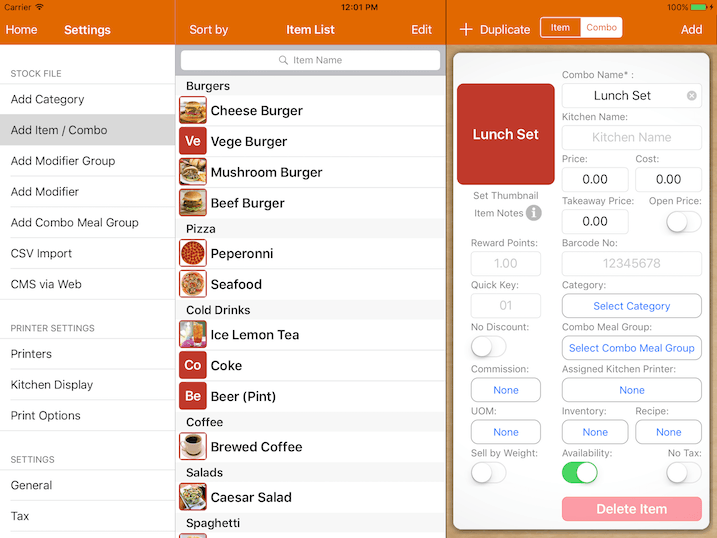 In the cash register page, if you click on 'Lunch Set' item, it will prompt you to select all the items available under each group before allowing you to add the combo. To indicate that the order is part of the combo meal, it be will in grey.